If you’re travelling to France this summer, a good tip is to avoid spending a fortune on restaurants and give the country’s extensive food markets a chance. 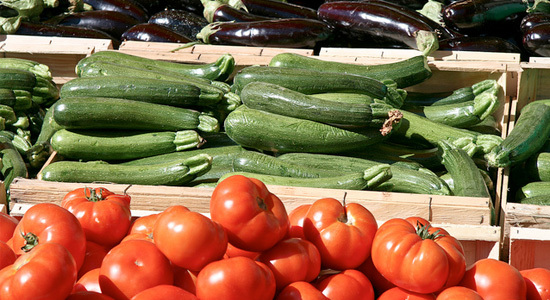 In France, August and the late summer period is the best time for lighter delicacies, with vegetables, fruits and fish stealing meat’s thunder in most restaurants across the country. Here is a selection of the most delicious seasonal products worth sampling during your French holiday in August and September. Aubergine caviar There are no fish eggs involved, so don’t worry if you’re not too keen on “proper” caviar. It’s more of a delicious pate, perfect as a spread or sandwich filler and great as a starter. Aubergine fries It’s as simple as it sounds: Aubergine sliced and fried just like chips. A great alternative to McDonalds. There’s almost nothing better than snacking on fresh fruit on a summer’s day. The fruit season is almost over, but there are several varieties that are at the peak of tastiness right about now. Apricot (abricot) France produces over 30 different types of apricot, which means that the harvest times change depending on regional climatic variations, along with many other factors. But not to worry: you can be sure that by mid-August you’ll have managed to taste all of them. French apricots are extremely diverse and it’s easy to feel lost when the moment of choosing comes. To make your choice easier, we recommend the apricots from Rhônes-Alpes, Pyrénnées Orientales and Languedoc Roussillon. Melon of Cavaillon (Provence) No other fruit encapsulates the essence of summer lightness better than melon. In the small town of Cavaillon, an irresistibly juicy type of melon has been grown since time immemorial, and nowadays its future is preserved by the Cavaillon Melon Consortium. Absolutely mouthwatering and the perfect treat on a hot day. Nectarine (brugnon) France is one of Europe’s biggest producers of nectarines, with the bulk of production coming from three regions: Languedoc-Roussillon, Provence-Alpes-Côtes d’Azur and Rhone-Alpes. Between June and late August – depending on region– a wave of exquisite nectarines invades food markets across the country. 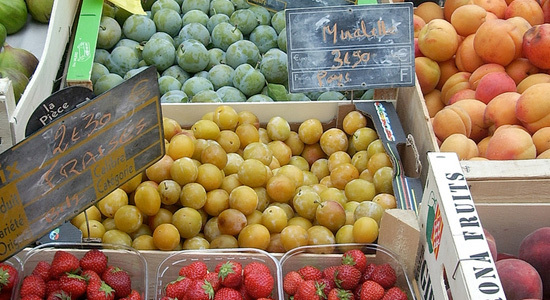 A fruity purchase you don’t want to miss during your French holiday. Plum (Prune) France grows a wide variety of plums, with production focusing on the south-west and east of the country. As choosing the right type of plum can become a tedious dilemma we recommend two labels. The first one is the Reine-Claude Doree plum from the Midi-Pyrenees region. The second variety is the Mirabelle de Lorainne from Nancy, which is great as fresh fruit, where its counterpart from Metz, is better suited for jams. Both the Reine-Claude Doree and Mirabelle de Lorainne are harvested in mid-August. So, take notes and be sure to make the right choice at the market. If you’re thinking that this list can’t leave out seafood, you should know that in France seafood is always in season. With Normandy providing the whole country with top-quality scallops and sole and Brittany specializing in lobster, crayfish and mussels, there’s constantly something to sink your teeth into. But some varieties taste better this time of year. Here we’ve selected a few of them. Sardines of Quiberon (Brittany) There’s something special about this small fish living in the waters of Brittany. Even though the sardines of Quiberon can be enjoyed in oil throughout the year, the fishing season hits a peak between June and November. If you’re by the sea you can pick up a few right off the boats. Anchovies of Collioure (Pyrénées-Orientales) Back in 2004 this variety of Engraulis encrassichotlus (sometimes we like indulging ourselves in big words) was honoured with the European label of PGI (Protected Geographical Indication), confirming itself as one of the most popular varieties of fish among French people. The fishery is conducted between April-May and September-October rigorously with nets. Anchovies of Collioure can be enjoyed in three different ways: salted, brined and in oil. Mussels It’s almost a rule: You can’t go to france without having seafood. The mussel season will start again in September and there’s nothing like enjoying mussels and a glass of white wine in the autumn sun. 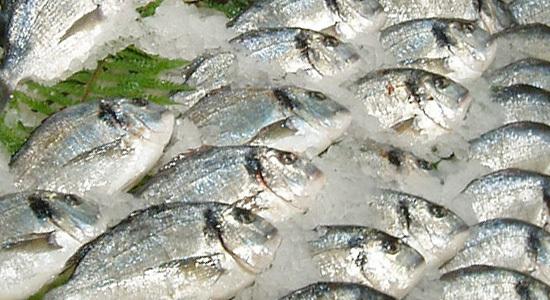 The western coast is known for their quality seafood, so if you’re in the area we highly recommend you try it. 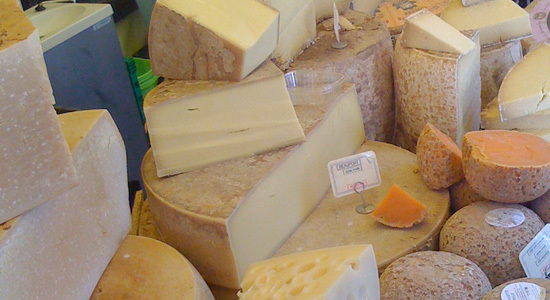 There’s no way we can write about French food without mentioning cheese. There are always plenty of cheeses to indulge in, but in the months of August and September, there are a few specialties we recommend. Chaource (Champagne-Ardenne) This cheese is very similar to the famous camembert, but creamier. If you fancy a champagne breakfast, this cheese is perfect to serve with it. Some people would claim it’s best in spring, but we find that by late summer the cheese is deliciously smooth and nutty with a rounder taste. Popular at cheese markets around France, you won’t have any problem finding this no matter where you are. Brie de Meaux (Seine-et-Marne) Brie is one of the more popular French cheeses and it’s often underestimated. Just remember, you haven’t tasted real brie until you’ve sunk your teeth into a Brie de Meaux. The cheese is produced in Ile de France and is an ancient cheese. It’s made from cow’s milk and is usually matured for 6 to 8 weeks before turning into pure deliciousness. P&O Ferries helps you eat healthy with its super convenient 90-minute route from Dover to Calais. Paris, Amsterdam, and Bruges- They are known as the most romantic cities in Northern Europe. But there are plenty of steamy and dreamy places scattered across France, Belgium and the Netherlands that would make for great getaways too. Here is a guide to our favourite “hidden” romantic destinations you and your other half should pay a visit to. 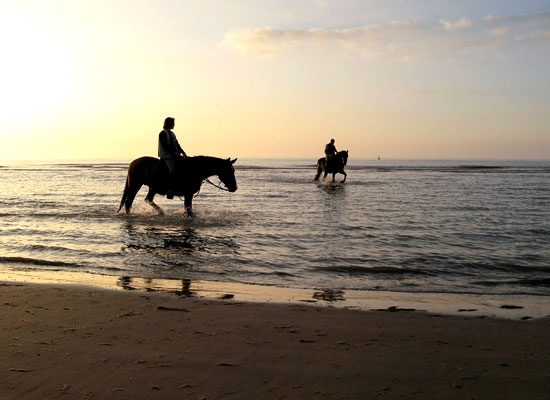 Known as “the queen of the Norman beaches” and “the Parisian Riviera”, Deauville is one of the most popular seaside resorts among the French and international upper class. The town services can meet the most demanding needs. A wide choice of luxurious 5 star hotels, glamorous designer shops and a renowned casino make Deauville the ideal destination for hedonist couples in search of the finest worldly pleasures. Situated on the lake of Annecy and surrounded by the Aravis mountain range, Annecy is possibly the most romantic city among the hidden French destinations. Rightly honoured with the nickname Venice of Savoie, the city is immersed in a surreal magic atmosphere due to the incredibly well-preserved medieval center and its stunning network of canals. The Italian and Swiss borders can be easily reached by car, so you may also want to expand your romantic holidays beyond France. Feel like driving to France? Take a look at P&O super fast ferry from Dover to Calais. We run up to 46 crossings a day and each crossing takes only 90 minutes. A small lake district in South Holland, the Kagerplassen tends to be forgotten by some guides, which is a crying shame since the uncountable waterways running through the picturesque villages are a pleasure for the eyes. The area offers a decent variety of activities, such as lake cruising, water sports and walking tours. A must-visit for lovers of inspiringly wild landscapes. The best romantic alternative to the capital. We love Amsterdam, don’t get us wrong, but Haarlem, the capital of North Holland, has stood in the shadow of its bigger brother for way too long. 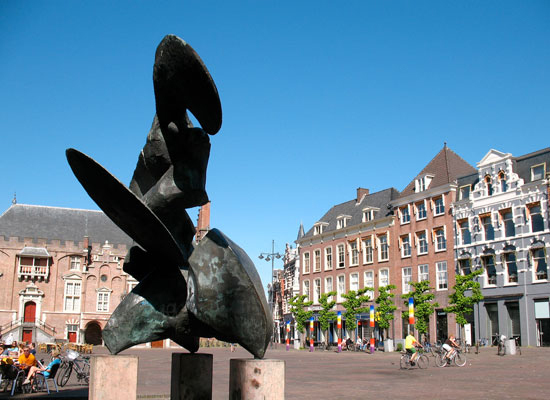 We can almost guarantee there’s not much you will dislike about this charming city and its amazing cultural sites, such as the Grote Markt and the Tulip Centre. If you’re lucky enough to be around in early spring, you may want to drive through the bulb fields in the surrounding countryside. During spring time it’s filled with an explosion of colours and emotions that will never leave your couple’s book of memories. Europe’s biggest peat-bog, De Groote Peel National Park, is the ideal destination for all lovers of immense landscapes and intense silences. The park is no regular bog: it preserves a uniquely large peat that has survived human cutting which used to be extensive in the past. One of the richest varieties of birds in Europe enriches the network of lakes and heath land with an explosion of colours, which you can comfortably enjoy from the 3km route of bridges and footpaths. Located only a 40-minute drive from Eindhoven, De Groote Peel National Park is an easily accessible and attractive destination. Driving to the Netherlands has never been easier thanks to P&O Ferries. Our Hull to Rotterdam route will make your romantic getaway the most comfortable experience of your life. This might not be the sexiest place you’ve come across in your life but it offers a quiet life away from the rest of the world, with easy access to attractions at the same time. De Haan offers not much more than peacefulness, gorgeous Belle Epoque architecture and Albert Einstein’s house. We think that’s plenty, but should you get bored, Bruges is only a 30-minute drive away. If you happen to be around in the summer, you have easy access to the whole Belgium coastline as well. Bruges is known for being Belgium’s most romantic city, but why not try somewhere new? We at P&O Ferries recommend Ghent, Belgium’s second biggest city and certainly a great romantic alternative to Bruges. The splendid architecture the medieval architecture of the city alive. Ghent also sports Belgium’s largest car-free area, and its well-signed walking paths will help you to enjoy your visit to the fullest. The city hosts many cultural events throughout the year, and if you love good food, you’ll be happy to hear that a vibrant culinary tradition is well alive. But Ghent is much more than this, which is why we believe you should definitely give it a try. There’s hardly something more romantic than dining under a starry sky on a boat. You can take several different river cruises across Belgium, you just need to choose which suits you best. P&O Ferries recommend you this 5-day cruise in North-East Belgium . Share a boat with six other people and be introduced to Belgium’s hidden treasures such as the castle of Ooidonk St. Martens Latem from a unique barging perspective. P&O Ferries have a convenient daily ferry that takes you from Hull to Zeebrugge overnight.